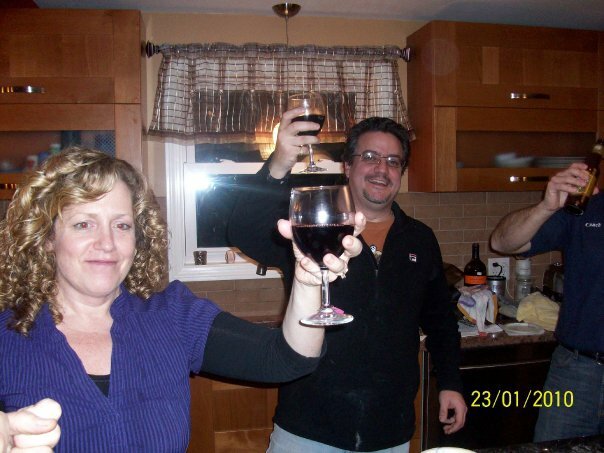 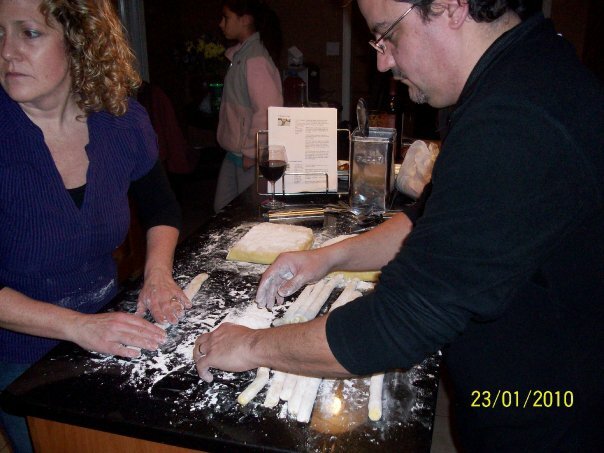 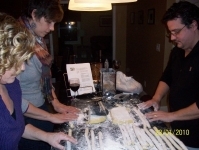 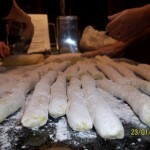 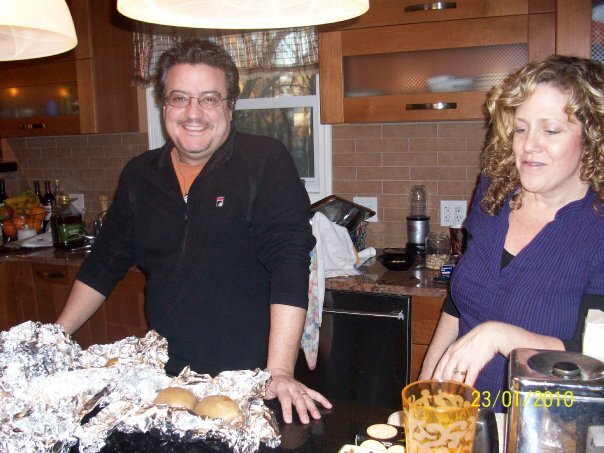 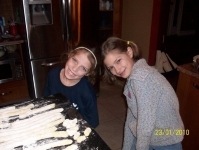 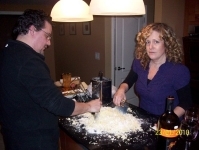 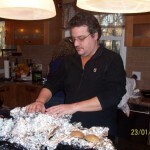 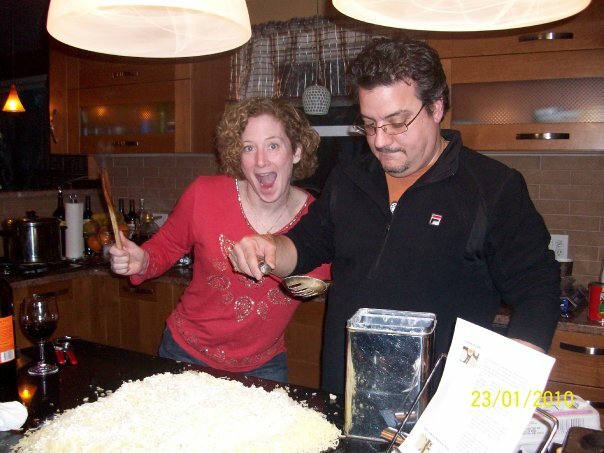 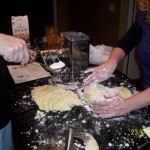 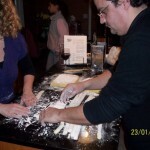 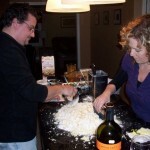 Mastrio Web Page » The Archive » Gnocchi Night – A success! 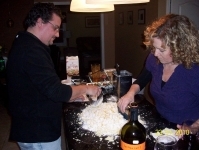 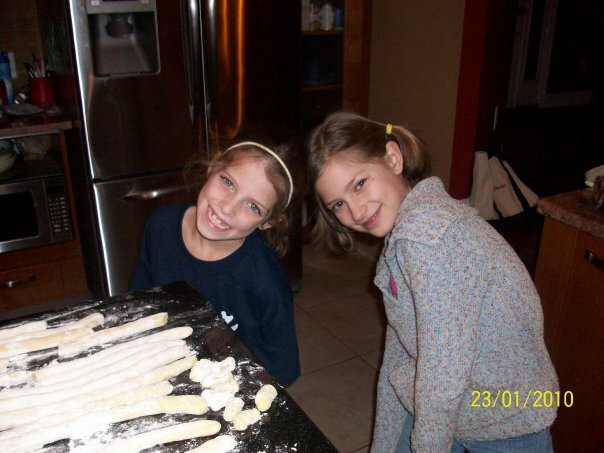 Gnocchi Night – A success! 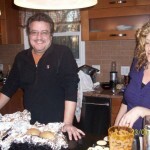 A couple of months ago, I was over our friend Mary I’s house and we were talking about, of all things, food! 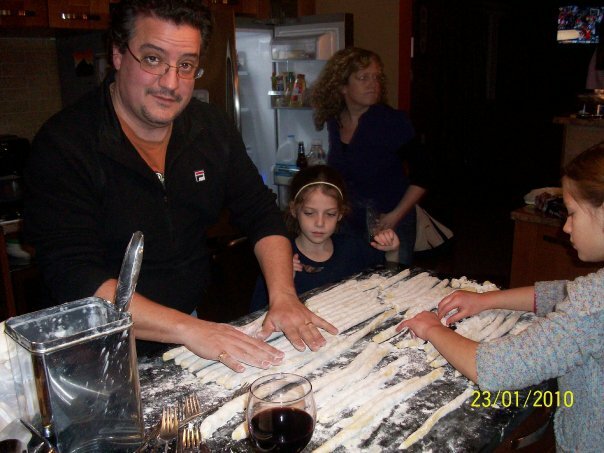 I mentioned how I made gnocchi with the kids and we had a great time doing it as a family… and Mary thought “ooh, let’s have a get together and make gnocchi”. Well, we did it and it was an absolute success! 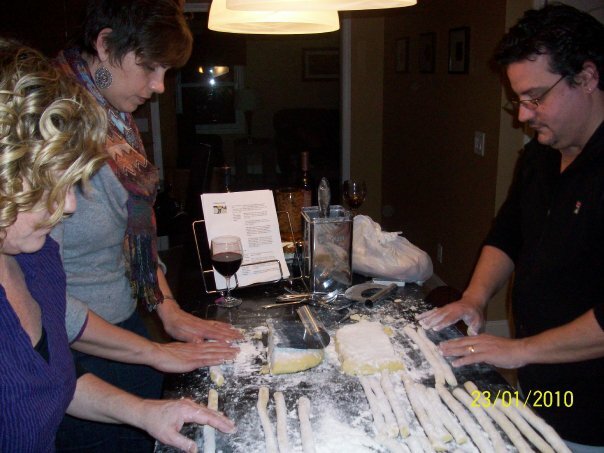 Gnocchi are very easy to make and if you have a bunch of people involved, everybody can get in on the action. 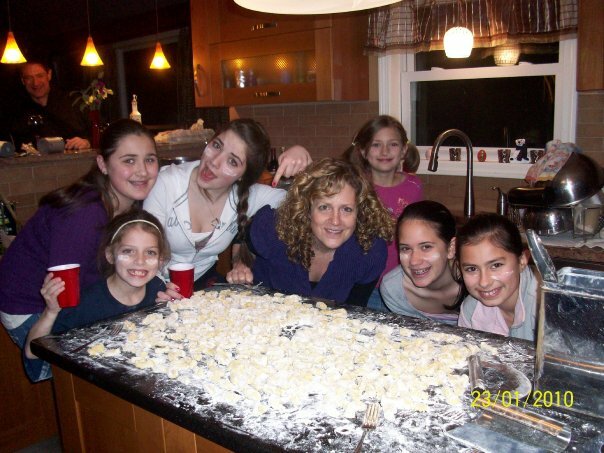 Preheat your oven to 400 º degrees Fahrenheit. 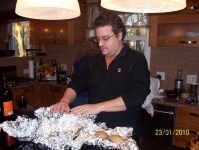 Put the potatoes onto some foil, add the salt and water, and wrap. Bake for approximately 40 minutes, or until cooked through. 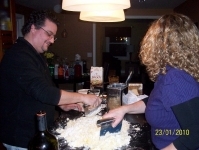 I’m pretty sure it took closer to an hour, but at that point we had already started drinking wine! Sprinkle the potatoes with a good amount of flour. Aerate the potatoes with a bench scraper, and then add the salt, nutmeg and white pepper. 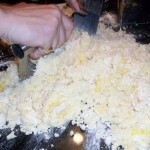 Mix up the egg yolks and pour them over the potatoes. 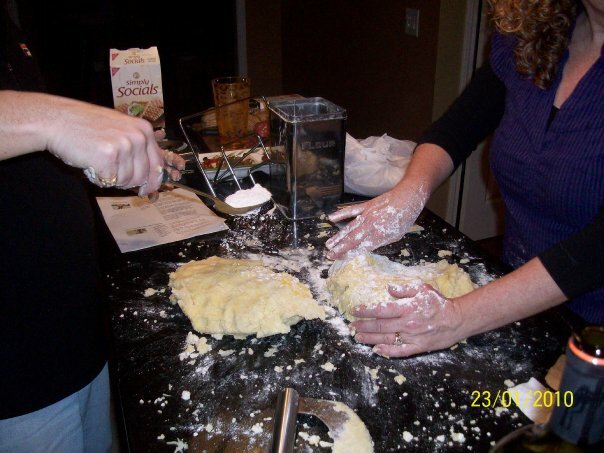 Cover the surface again with more flour. 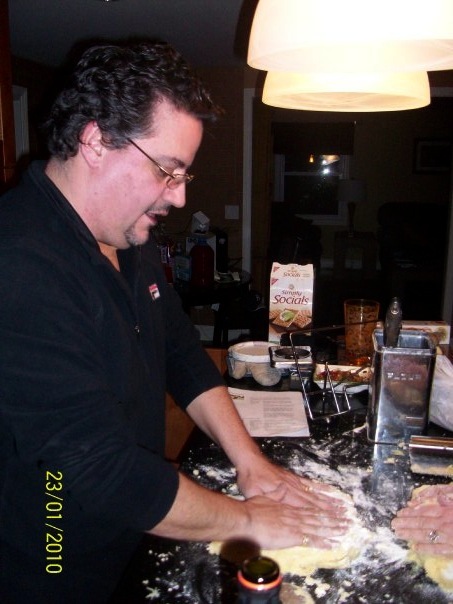 Continue to cut and gently lift the dough. 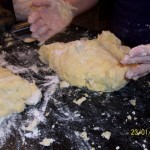 Test the dough by squeezing it gently in your hand. It shouldn’t stick. 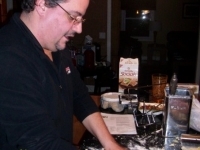 Add a bit more flour, if needed. Once done, shape the dough into a rectangle and fold it a few times, using your fingertips to bring it together. 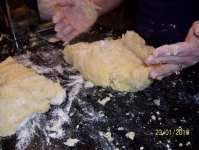 Flatten the dough out until it is about the thickness of your finger. Sprinkle with flour and let rest about 5 to 10 minutes. 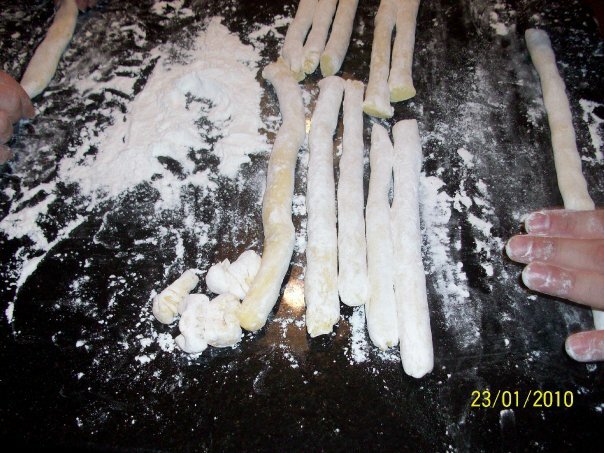 Cut strips of dough, about the width of your finger, and sprinkle with flour so they don’t stick to each other. 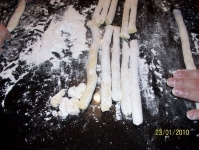 Roll out each strip and cut the ropes into 3/4 – inch pieces. 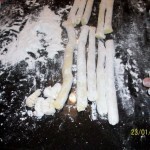 Separate them slightly, and flour them well, so they don’t stick together. 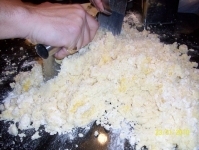 The last bit was to cut them into about 1″ pieces then roll them down the back of a fork… it’s tricky at first, but once you get the hang of it, you get the fork mark on one side and an indent on the other side, great for catching all that great sauce! 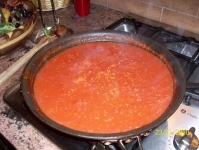 I heated the mixture in a steel bowl over the boiling water – THEN to make it really interesting, I put it all into a “magic bullet” device, with some olive oil and puree’d it all… it sort of emulsified and thickened a bit – Oh Soo good! 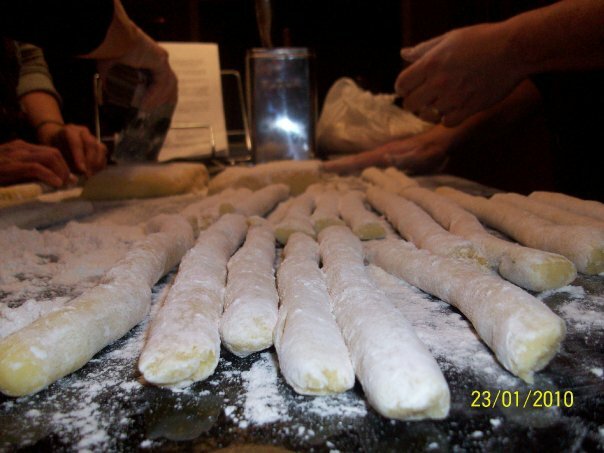 The gnocchi cook FAST so have your boiling water ready and do them in small batches so as not to make the water cool and take a long time to bring back to a boil. We did about 1 to 1.5 dozen at a time. We scooped them right from the water right into a pan of either sauce or the sage-butter mixture… and then served. 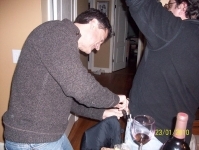 In the meantime, please enjoy all the pictures from that night!